Instant Audiophile Classic: Mobile Fidelity's 180g 2LP Set Renders Atmospherics, Whisper-Soft Transients, Acoustic Dimensions, and Images With Utmost Detail and Precision "No One Else Writes or Sounds Like This"-Chicago Tribune Also Available on 180g 2LP from Mobile Fidelity Accessible and complicated, alluring and challenging, sensuous and liberating, Patricia Barber's Smash once and for all confirms the pianist/singer exists in an elevated artistic plane reached by none of her generational peers. Four years in the making, and the beloved musician's first studio record since 2008, her Concord Records debut defies expectations and crystallizes her status as a preeminent songwriter. Informed by personal episodes of significant loss and yearning, the album masterfully unites harmony and melody via uncommon delicacy, tonal intimacy, and ethereal surrealism. It will likely stand as 2013's finest jazz effort, an instant classic. Mastered from the original master tapes, possesses audiophile-quality fidelity and dynamic transparency unmatched by the commercially released CD. Akin to the reissue label's previous Barber releases, many of which are long out-of-print and command huge sums on the collector's market, Smash brings the singer and her band into your listening room, converting it into a recreation of the stage at Chicago's Green Mill, Barber's home base. Sonic characteristics crucial to Barber's sophisticated compositions-atmospherics, decay, whisper-soft transients, mood, acoustic dimensions, precise imaging-are rendered with utmost detail, balance, and accuracy. All else that's required for your trip to the Green Mill is a stereo and glass of chardonnay. 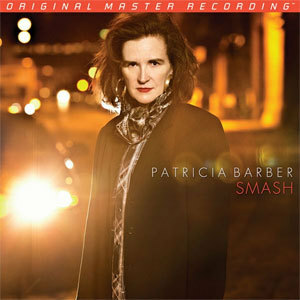 Punctuated by deft instrumental passages and mysterious verses, Smash marks a triumphant return for Barber after she endured a series of melancholic episodes, including the death of her mother and four other people close to her. In addition, a disagreement with business associate cost her untold amount of money. She also broke away from Blue Note after its president stepped down from his position. Barber channels these painful, often-angry experiences and transitional periods into expressionistic poetry on Smash, transferring her emotions to arrangements that mirror the deep, meaningful cycle of human life and death. Backed by a brilliant trio, Barber opts for her now-signature subdued methods, allowing each syllable to linger, every note to hover before fading, each rhythmic line to develop unique relationships with the groove. Chicago Tribune jazz critic Howard Reich wrote in his rave review of Smash: "No one else writes or sounds like this, in other words, because no one else approaches the art of singing, songwriting, and piano playing with Barber's particular interests. The liquidity of her vocals, the sharp edge of her jazz pianism, and the quirkiness of her original songs cannot be imitated and remain a work in progress." These aspects, and more, are immediately apparent on Smash, arguably the boldest and most satisfying set of the reclusive talent's career. Her famously seductive and breathy vocals, supple right-hand runs, and nuanced harmonics simultaneously engage, hypnotize, and tempt. Her mates follow suit with aptly sculpted bass lines, taut percussion, and suggestive guitar fills. A model of economical succinctness, Smash takes risks, harbors intensity, and utilizes silences to communicate. It represents a new level for 21st century jazz, and there's no way to better way to experience it and immerse yourself in its powers than via Mobile Fidelity's superb edition.